Are you ready to earn your turns? Are you an advanced or expert skier/rider? Do you have avalanche beacons, probes and shovels? If so, then Mammoth has some of the best and most easily accessible backcountry available. The Sherwins, Mammoth Crest, The Negatives, and Bloody Mountain give Mammoth skiers and boarder enthusiasts a lot of variety in the winter. For information on hiking the Sherwins, Mammoth Crest, Bloody Mountain, or the Negatives, ask the Ski Patrol at Mammoth Mountain Ski Area. Always wear your avalanche safety equipment and check with the USFS on the snow conditions. The Visitor Center is located on Highway 203 also known as Main Street just before the signal at Old Mammoth Road. The Sherwins can easily be accessed in less than one hour. To start your journey, park a car on Ranch Road, off of Old Mammoth Road (at the bottom of the Sherwins). Make sure to look at the runs, and figure out where you want to go. From here, catch the Red Line bus to the transfer area, where you will catch the Orange Line. Take this bus to Twin Lakes. The trail starts where Lake Mary Road ends. Follow the Cross Country trail (stay to the left) for five to ten minutes. Look for a trail that leads to the left, on the spine of the Sherwins. The trail is accessed almost daily, so there should not be a problem finding it. This part of the trail is steep, and takes about 45 minutes to hike. At the top, you can hike across the ridge, until you find where you want to drop in. The first Bowl is Easter Bowl. The second bowl is little Avy Path (short for avalanche), and at the top of this bowl is the Hose. The next and biggest bowl is called the Avy Path. Following these bowls are the Finger Chutes, and finally Rock Chute. Always check snow conditions and use avalanche gear. The best time to go is one day after a storm, giving the snow time to settle. Stay out of the avalanche paths and have fun. Hint: The Hose and Rock Chute are two of the better runs. At this time there is no helicopter skiing allowed at the Mammoth Resort. Terrain is labeled "out of bounds" and they mean it. However, to get a similar thrill, you might want to hire a guide to take you into the backcountry. Nope, sorry. If you're looking to make those fresh tracks, you'll just have to come at the last minute when we get our big snow dumps and be first on the hill. 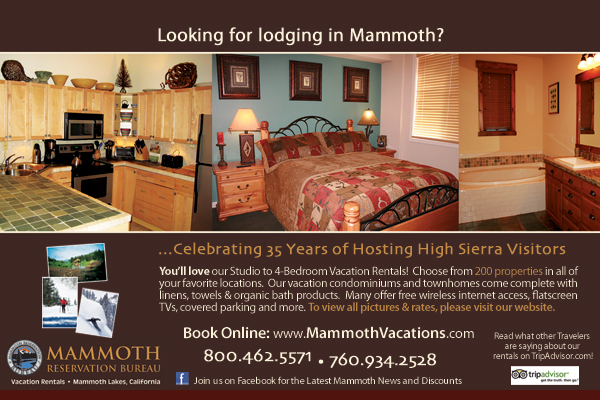 We have a little special for those last minute mammoth trips.